I am 7 weeks, 6 days in this ultrasound and surprised to find out that we are not just having a third baby, but a fourth as well! There's just one placenta - which I think means identical - but they aren't sure if there is one sac or two yet. 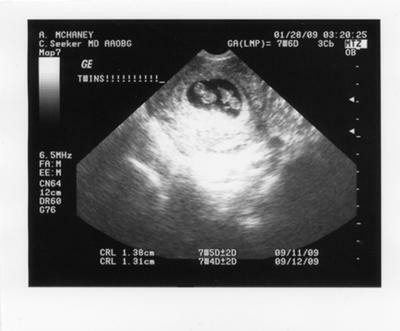 My wife and I found out on December 30, 2010 that we are having twins. This came as a shocker to both of us. The pregnancy was not planned, and neither was having twins!! I am still in shock, and don't really know what to expect. But, anyway, we are only on week 7, and I have lots of questions on how do you know the difference between identical or fraternal. We only got the one ultrasound pic. of each baby. Neither pic. shows both of them together. It seemed to me that there was quite a bit of space between the two of them, but I was also seeing for the first time, twins!! I went back to the OB on Friday (2/27) and they think they are mono-di - is that the correct way to put it? They did see a membrane - thin - between the two babies. I had the nuchal translucency and both babies measured 1.5, which was great. And both babies measured 12 weeks and 2 days, which is one day ahead of my due date. The guess on Friday was two boys. I go back 3/18. I remember when I found out, I could not help but to laugh. Both my brother in laws have a set of twins. One child first and the second time around they had twins, same as my husband and I. Your twins look the same as mine which are identical they share the same placenta but r in different sacs... Congrats and Good luck :) . God Bless you and your growing family.